Above: Class A3 No. 60066 'Merry Hampton' passes Grantham South signal box while approaching the station with a Down express in the early 1960s, before its transfer to Grantham. Hylton Holt has been in touch to relay a story from the final three months of Grantham Loco. In June 1963 King's Cross shed closed, and Grantham received those of its A3 locomotives that were fit for further service . Within a few weeks one of them, No. 60066 Merry Hampton, turned up at St Margaret's shed in the east end of Edinburgh, some 285 miles from its base at Grantham Loco. 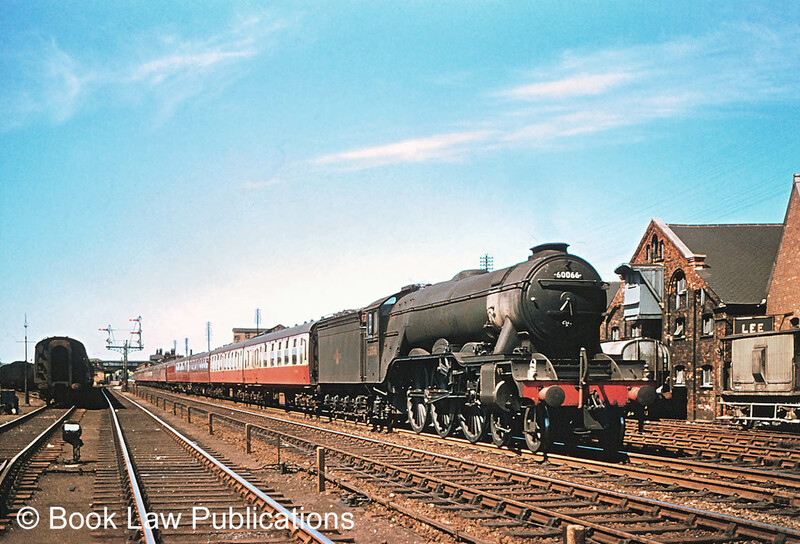 I've received a message from my Engine Shed Society colleague Grant Dowie, who reports that he'd heard of 60066 arriving North of the Border on Tuesday 20th August 1963. He cycled the six miles from Musselburgh to St. Margaret's early the next day. Uniquely, and I'd echo this, he was stopped by the Foreman who asked what was he doing there, and so early in the morning? Grant explained he was there to see 60066 to which he was told “Oh, that's OK then!” The Foreman evidently recognised the importance of such a visitor which was not 'just another (Ah!) A3'. Grant comments that this is a last hurrah for “Merry Hampton” as, you'll know, she was one of the last locos to leave for Donnie and 'The End' under her own steam on 34F's closure date, 7th September 1963. Colin Walker, in Trails of Steam Volume 6 - Trails through Grantham, described her hauling 'a paltry train of two wagons and a brake van.' 60108 Gay Crusader had the last steam-hauled express working out of Grantham, and Colin concluded, “Somehow one felt they deserved a better end.” I still do. Grantham shed last day - Saturday 7th September 1963. A3s No. 60066 Merry Hampton (left) and No. 60061 Pretty Polly prior to departing for scrap at Doncaster. By the the summer of 1963 diesels had taken over most main line trains, and the principal regular duty for Grantham's A3s was taking turns as standby pilot in case of a breakdown. What took No. 60066 as far as 'Auld Reekie' we do not know, but there may be a paragraph somewhere in one of the monthly magazines of the time. Can anyone tell us? Relevant or not, it is a fact that from its completion at Doncaster Works in 1924 until 1950 this engine (as an A1 and latterly as an A3) had been based in Scotland, or at Carlisle or Gateshead. During that period it was involved in two serious accidents. As No. 2565, Merry Hampton it was derailed in May 1926, turning onto its side when hauling The Flying Scotsman southbound near Cramlington in Northumberland. Striking miners had removed a rail, but fortunately casualties were light on that occasion. In October 1947, by then designated No. 66, it was involved in another derailment in the same county, at Goswick, this time at speed and with fatal consequences. It was again on The Flying Scotsman southbound, and once more it ended up beside the line on its left side. After August 1950, as No. 60066, it was always shedded further south, in 'Great Northern' territory between Doncaster and King's Cross. Could there have been a fear in the North Country of accidents striking in threes - and what with this engine now having three '6s' in its new British Railways number, applied in 1948? Nevertheless, just a few weeks before that final trip to the scrapyard, Merry Hampton managed to set foot once again on the Northumbrian and Scottish metals it had pounded in its youth. Perhaps any remaining ghosts at Cramlington and Goswick needed to be laid to rest? Photographed from almost exactly the same location as the picture above, but facing in the opposite direction, No. 60066 'Merry Hampton' is seen heading towards King's Cross with an express in the late 1950s or early 1960s. Photograph taken by Keith Pirt. There is film of the Goswick derailment here. The Ministry of Transport accident report is here. Further to Hylton's interesting piece on the sighting of No. 60066 Merry Hampton at Edinburgh St Margaret’s shed on the morning of Wednesday 20/8/63, I have some information about its movements around Edinburgh in the previous few days. 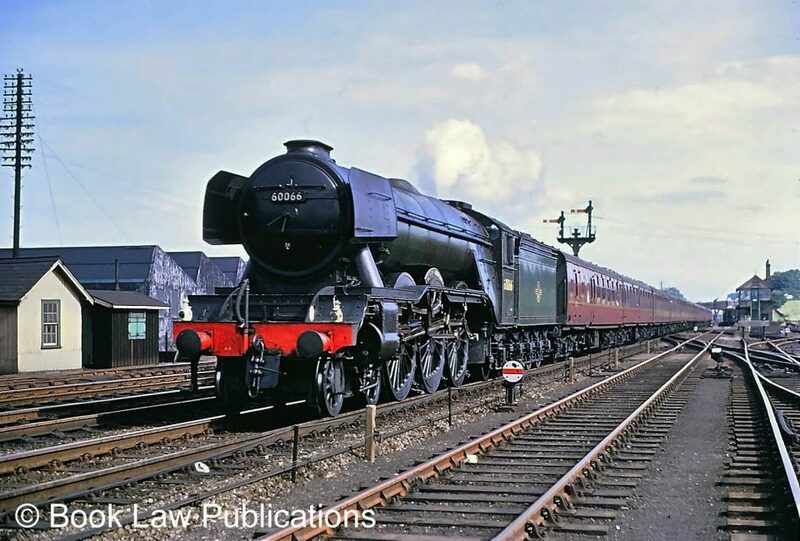 This was a time when Gateshead used Grantham (34F) pacifics for trips North of the Border because of their own shortage of steam power. On Friday 16/8/63 No. 60066 was observed at 64B Haymarket shed (west of Edinburgh Waverley station), and on the same day she worked an empty coaching stock (ECS) train into Edinburgh from Craigentinny Sidings (which are on the east side of the city from Haymarket, beyond St Margaret’s shed). She was seen again on ECS around Edinburgh on Monday 19/8/63. Then, on Tuesday 20/8/63, she took a southbound freight from Millerhill Yard. She was serviced at Gateshead shed later that same day. The Railway Observer for 1962 includes information about a regular diagram for a Grantham pacific taking it to Edinburgh on a Friday/Saturday night, and returning to Newcastle in time to haul a Monday morning Up passenger train as far as Grantham. During its stopover in Edinburgh the Grantham pacific could be used on a variety of jobs, and on one occasion No. 60106 Flying Fox worked a freight to Carlisle. No. 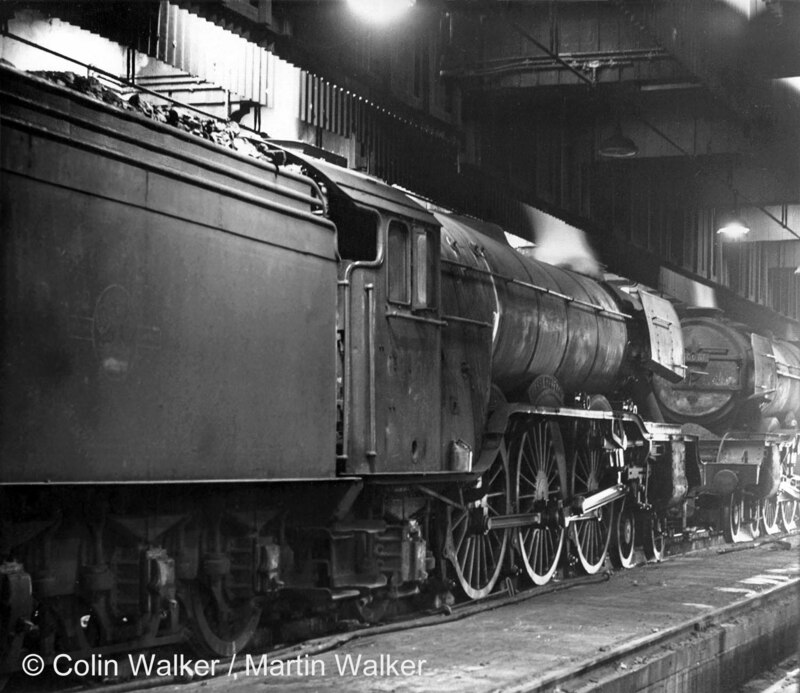 60066 must have returned north, after servicing at Gateshead, to be seen by Grant Dowie at Edinburgh St Margaret’s shed early on Wednesday 21/8/63 as described by Hylton.